“There’s something about pasta, cooked properly, that trumps all the other possibilities. And the smell of pasta boiling is a heady cheap thrill. With a few basic staple pantry items, a true feast can be ready in minutes. 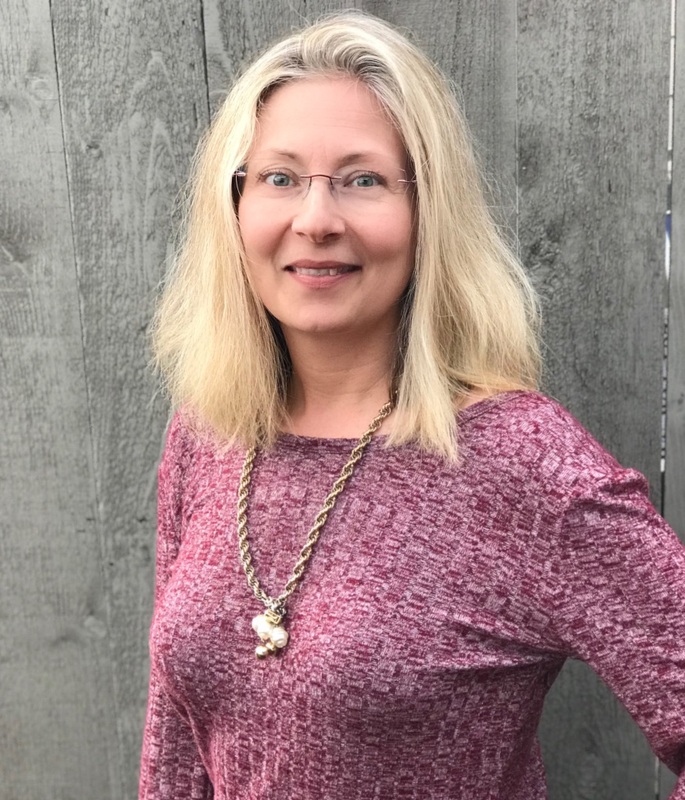 Good spaghetti, good olive oil, garlic and a little red pepper are all you need, plus some anchovy and capers if you have them.” So says David Tanis, food writer for the New York Times and author of one of my favorite cookbooks, One Good Dish. He’s right, and slurping up noodles has to be one of life’s simple pleasures. Pasta is feel-good food, without a doubt. But often a belly-full of noodles makes me feel sleepy and sluggish. Enter the vegetable spiralizer. 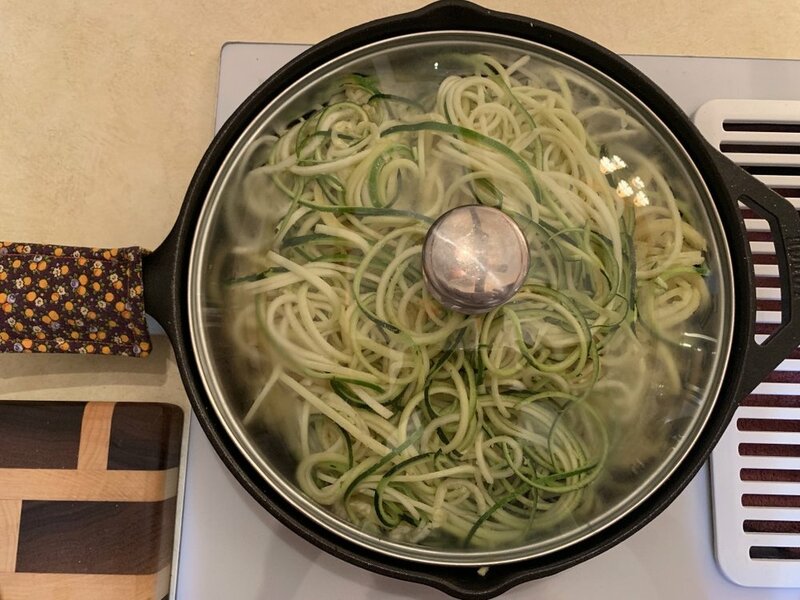 A spiralizer, and I’m talking about a respectable counter-top model, not a hand-held-pencil-sharpener-type, transforms everyday vegetables into soothing, slurp-able noodles, “pasta,” ribbons, and even “rice”, with a turn of a handle. Most spiralizer manufacturers recommend starting with zucchini. Zucchinis are relatively easy to source year-round at the market and are simple to spiralize due to their soft texture and elongated shape. It’s how I started out. Better yet, potato and zucchini together, as my friend Amanda suggests. 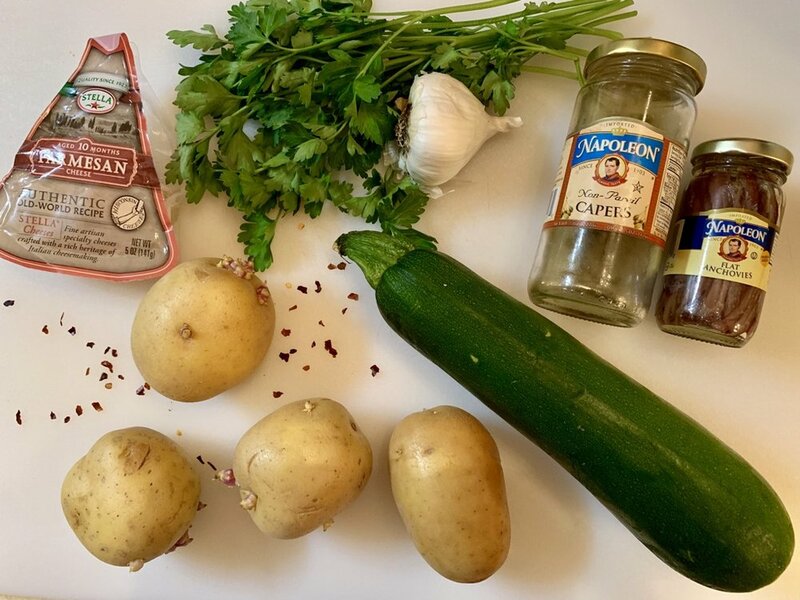 Potatoes also spiralize easily and when cooked in the same pan with zucchini noodles, potato noodles will basically steam in the juices released by the zucchini. When I saw the original New York Times recipe, I knew it was perfect for spiralizing. I substituted spiraled zucchini and potato noodles for spaghetti pasta, lightly steam-sautéed instead of boiled, and wow. SO GOOD. 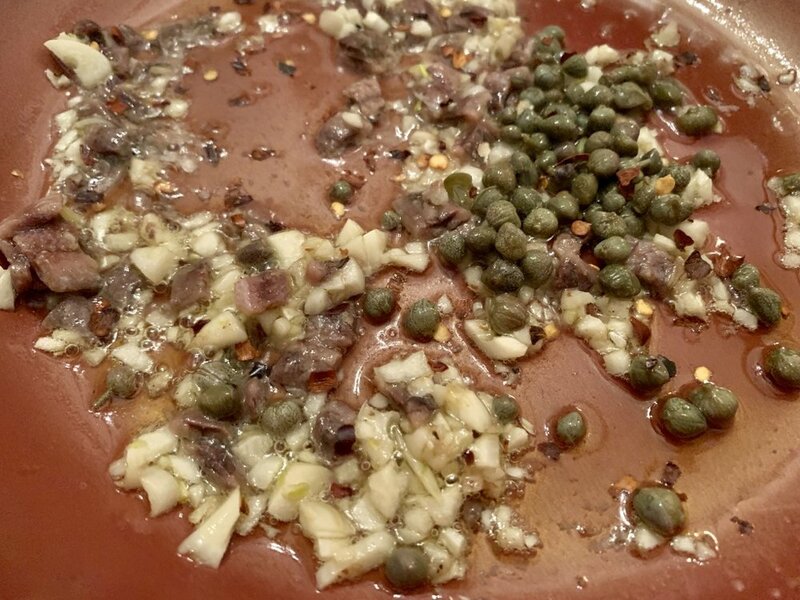 Even if you think you don’t like anchovies and capers. Their flavors don’t stand out, but rather meld into a savory sauce that might remind you of Caesar salad without tasting fishy or vinegary. Prepare veggies for spiralizing: wash, pat dry with a clean dish towel, and use a chef’s knife to cut ends off flat and even so the teeth of the spiralizer have a flat surface to grab. (This applies to both the zucchini and potatoes.) If organic, no need to peel the potatoes. If conventionally grown, go ahead and peel before spiralizing. Place a skillet, preferably cast iron, over medium-low heat to begin heating. Spiralize the potatoes using the spaghetti blade. Add 2 tablespoons olive oil to the skillet and tilt pan to coat bottom. Add potato noodles to pan and toss lightly with tongs to coat with oil. Cover with lid. Spiralize zucchini using the spaghetti blade. Use clean kitchen shears to trim noodles to manageable size. Add to skillet, toss to combine, and season very lightly with salt. Cover and steam-sauté, just until al-dente. This will take about 6-8 minutes, tossing noodles every 3 minutes with tongs to cook evenly. DO NOT OVERCOOK or noodles will turn mushy. Meanwhile, prepare sauce. Warm remaining 2 tablespoons olive oil in a small skillet. Chop garlic and add to oil. Sauté 1 minute without letting it brown. Chop anchovies and add to garlic with capers and red pepper flakes, sauté 30 seconds, then turn off the heat. As soon as noodles are done, they should have some texture, not be completely soft, use tongs to lift them to a large shallow pasta bowl to stop cooking. Pour sauce over and toss to coat noodles well. Offer Parmesan, a pepper mill, and chopped parsley for topping.